As we all following many safety rules at our work place, why we are not implementing the same at home? Any one guarantees our life at home without safety? Or we are suspecting that safety will not play vital role at home? Home safety refers to the awareness and education of risks and potential dangers in and around a home which may cause bodily harm, injury, or even death to those residing in and around the physical structure of a home. It includes mitigating or preventing the unwanted dangers through testing, research and accepted standards of applications and practices. Slip and trip- falling accidents at home are very common and can cause serious and life-threatening injuries, so prevention of slip and trip accidents is essential in the good design of living quarters. The objective is especially important for the elderly and disabled, who may be of restricted movement and more susceptible to hazards. It includes of adequate supports such as handrails and balustrades as well as ensuring walking surfaces are of high friction and thus slip resistant. Lighting is also vital for being bright enough to enable the user to see obstacles when walking into a room, for example. Users may also be provided with a walking stick or crutches to aid walking and personal support. 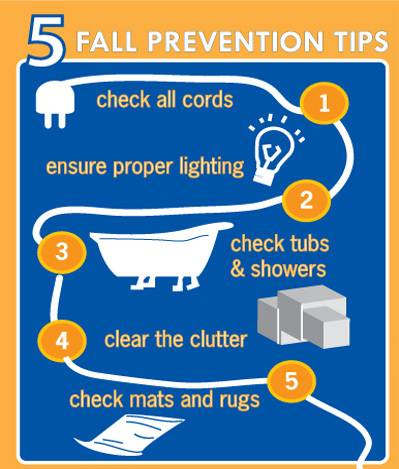 Fall prevention is an active form of protection for users. Toxic mold – Preventative steps include drying water damage and moisture control in the home. Inhaling or touching mold or mold spores may cause allergic reactions in sensitive individuals. Family safety plans – Family safety plans are an essential tool in fire safety because the plan helps family members to identify a fire escape plan. A safety plan includes knowing two ways out of every room, a safe place for members to meet outside of a burning home, and essential emergency telephone numbers. It is important to practice fire escape plans. Sprinklers – Fire sprinklers offer a layer of protection because the sprinkler can respond to fire while it is still small. Fire sprinklers respond only the sprinkler closest to the heat source. Smoke alone will not set a fire sprinkler to discharge. Fire extinguishers – There are five different classes of fires; A, B, C, D, and K. Class A consists of burning paper, wood, cloth or other combustible solids. Class B consists of liquids and gasses such as propane. Class C fires consist of electrical fires. While class D fires (which is less common) consists of burning metal and class K fires (the most common) consists of kitchen type materials, i.e., grease and oil. Fire extinguishers use a variety of substances to put out fires; dry powder, dry chemical, water, halogenated, carbon and foam. Since different substances burn differently, fire extinguishers are labeled (and often color-coded) according to the type or class of fire they can extinguish. It is, therefore, necessary to choose the correct fire extinguisher for home use. Fire alarms– Fire alarms monitors the environmental changes associated with combustion. Once the alarm has been triggered by fire or smoke, a loud sound emanates to warn of danger and sends a message to a central monitoring center, which then notifies the local fire department. Smoke alarms – Smoke alarms also known as smoke detectors, generally sound an audible and visual alarm. Smoke alarms are usually housed in a disk-shaped plastic enclosure about 6 inches in diameter and 1 inch thick and are often powered by a disposable battery. Heat detectors – Heat detectors are a device that responds to changes in ambient temperature. Heat detectors are not meant to replace smoke detectors. They are often placed in rooms where standard smoke detectors are not suitable, such as laundry rooms, garages, and attics. Home Fire Escape Plans– Create a fire escape plan with two exits from every room, and conduct practice drills with the entire family at least once every six months. When creating the fire escape plan, draw a layout that shows each room and potential escape route in the home. Explain the escape plan to children and ensure that they recognize the sound of the fire alarm and know to check the door for heat and how to stay low to the ground. Poison – Always have the number of your local Poison Control Center available and familiarize yourself with what to do in case of poisoning.Know which plants are poisonous and remove them from your home. Keep all medications, including over-the-counter medications secured and out of the reach of children. DO NOT make a person throw up unless told to do so by poison control or a health care professional. Adults have been prescribed opioids by doctors and subsequently become addicted or move from pills to heroin. Perhaps even more alarming: 70% of people who have abused prescription painkillers reported getting them from friends or relatives. Most people don’t know that sharing opioids is a felony. People who take opioid painkillers for too long and in doses too large are more at risk of addiction and more likely to die of drug poisoning. The numbers are staggering. In a 2014 National Survey on Drug Use and Health report, the Substance Abuse and Medical Health Services Administration says there are 4.3 million current nonmedical users of painkillers. Nearly 2 million people have painkiller substance use disorders. “Painkillers don’t kill pain. They kill people,” says Dr. Don Teater, National Safety Council medical advisor. People think taking opioids is the best way to treat pain. But the reality is other non-addictive medicines are just as effective, including many over-the-counter drugs such as ibuprofen or naproxen. can find out why you have the problem in your home and decide who is responsible for removing the infestation. This could be you, your landlord, or even your neighbours.